SYDNEY (AP) — The Christchurch-based Crusaders won their sixth consecutive match to begin the Super Rugby season, defeating the New South Wales Waratahs 41-22 on Sunday to give New Zealand sides a clean sweep of four weekend matches against their Australian opponents. The win moved the Crusaders into first place overall, ahead of two other unbeaten teams, the Chiefs and Stormers, who are 5-0. The Chiefs roused themselves from a slow start for a 28-12 bonus-point win over the Bulls, while the Stormers were never in danger against the Cheetahs, scoring eight tries in a 53-10 win. In other sixth-round action between New Zealand and Australian teams, the defending champion Hurricanes were too slick for the Queensland Reds, winning 34-15, the Blues struggled before finally subduing the Western Force 24-15, and on Friday, the Highlanders outclassed the Melbourne Rebels 51-12. 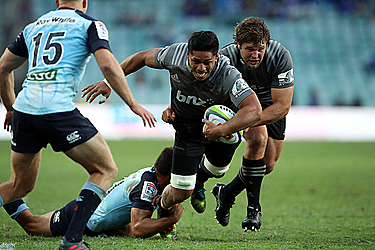 At Sydney on Sunday, the Crusaders led 19-10 at halftime but struggled early in the second half as the Waratahs kept it close. But the home side paid the price for a sloppy defensive display, missing 24 tackles in the first half and allowing two soft tries from lineout losses. The Crusaders have an unprecedented 10 consecutive wins over Australian sides stretching back to 2015. They'll be able to rest on their laurels for at least a week — they have a seventh-round bye next weekend. A late try by Lions flanker Jaco Kriel settled a titanic South African derby against the Sharks in Johannesburg. The Lions won 34-29 in a game that swung back and forth before replacement Kwagga Smith burst away and put fellow loose forward Kriel clear down the right wing in the 76th minute. No. 8 Sikhumbuzo Notshe scored three tries and wing Dillyn Leyds added two to lead the Stormers to their convincing win over the Cheetahs. The momentum changed again as Sharks flyhalf Curwin Bosch kicked a huge penalty from well inside his own half to edge the Durban-based team ahead near the end. Opposite number Elton Jantjies levelled at 29-29 before the try from Kriel extended the Lions' winning run at its Ellis Park home to nine games in Super Rugby. The ACT Brumbies of Australia, Argentina's Jaguares, Japan's Sunwolves and South Africa's Kings had weekend byes.